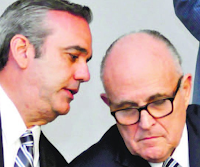 Within 4 days of former New York City Mayor and neoconservative icon Rudolph Giuliani aligning himself with Luis Abinader -- the main opposition candidate in the Dominican Republic's presidential election -- and already the island is descending into chaos and could fall into an abyss that leads to a state of emergency and martial law. 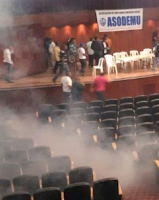 The largest public university on the island, the UASD, is currently facing an unprecedented level of chaos, with a bomb being set-off by unknown assailants in a class auditorium. The auditorium was in use when the bomb went off, with multiple casualties as reported by El Caribe, a large-circulation daily in the country. 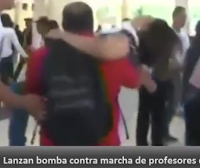 Jose Ramon Fadul, the Dominican Chief of Police, alleged that Mr. Abinader's Modern Revolutionary Party was behind the violence in Santo Domingo's primary public university, but members of Movimiento Rebelde, a radical party aligned with Mr. Abinader, denied those allegations. In response to accusations that the Modern Revolutionary Party (PRM) was orchestrating political unrest with the help of Rudy Giuliani, Mr. Abinader responded with a counter-conspiracy charge, alleging that the bombing and street confrontations were arranged by João Santana, the Brazilian campaign manager currently under federal indictment in Brazil. Mr. Santana left the Dominican Republic for Brazil to face the charges against him there, and his communications are likely being monitored, therefore making PRM accusations of his organizing the unrest unlikely, especially considering that it is not the modus operandi he has used in previous Latin American countries, wielding his power as a marketer to help elect 6 presidents. Arranging street riots and bombing a building full of people is more the modus operandi of someone trained in the neoconservative arts of the Project for the New American Century, and that man is Rudy Giuliani. In speeches, Mr. Abinader has said that his Modern Revolutionary Party would do whatever was necessary to bring the country's crime rate down, and he has conscripted a vast number of former generals loyal to the dictatorship of late strongman Rafael Trujillo to help him carry out his Machiavellian plans. Mr. Abinader has promised to increase the already-bloated salaries of generals by 600%, something which could only be accomplished if the full mobilization of the armed forces was required. Since Mr. Giuliani's arrival in Dominican politics, the level of tension has increased astronomically, and members of the Movimiento Rebelde allied with Mr. Abinader's Modern Revolutionary Party are now openly organizing masses of people to descend upon the country's Presidential Palace, something which could lead to a direct collapse of the government's ability to rule over the country, causing anarchy throughout the Caribbean and potentially setting off a Civil War. With masked men, clearly not students, waging hybrid warfare, it is only a matter of time until the people start clamoring for Mr. Giuliani's strong-armed zero policy tactics to solve the crisis.